In corrections, the best measure of success is generally agreed upon to be the recidivism rate, or the rate at which people reoffend after their release. In Oregon, the Department of Corrections uses the percentage of inmates who are convicted of a new felony within three years of their release to count recidivism. Among the most recent group of parolees to reach the three-year mark, 24.6 percent were convicted of a new felony within three years of their release from state prison. In national comparisons, this makes Oregon appear to have one of the best rates in the nation, but comparing recidivism rates can be misleading. For one, some states count recidivism as the percentage of parolees who are arrested or sent back to jail or prison for any reason. In the only state-to-state study of recidivism rates done to date, The Pew Center compared the rate at which parolees were returned to prison. Oregon came out ahead, but only because in Oregon, parole violations get you a bed in jail, not prison like many other states. So technical violations were not counted, explained Kelly Officer, a senior research analyst at the Criminal Justice Commission. According to the CJC, the state agency responsible for tracking crime statistics, 29.6 percent of inmates released from Oregon state prisons between January 2011 and July 2013 were convicted of a new misdemeanor or felony within the first three years of their release – and 42.3 percent were arrested. If that many offenders are finding themselves in handcuffs within three years of their release from state prison, Oregon may want to ask itself if it could be doing things better. And, as the Marshall Project pointed out in a report titled “The Misleading Math of ‘Recidivism,” those numbers only account for people who committed crimes within three years of their release – and got caught. FURTHER READING: Inside Oregon's prison workforce: Exploitation or opportunity? 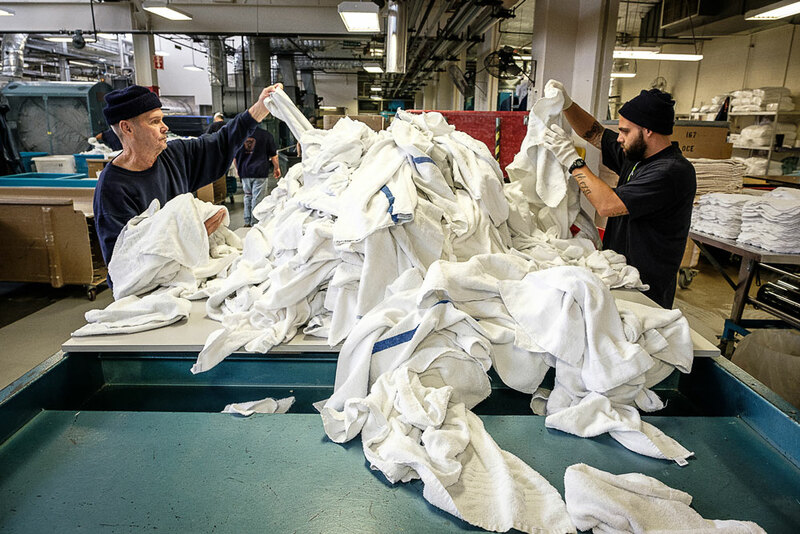 Inmates of the Oregon State Penitentiary sort laundry. The laundry service is one of 28 businesses operated by Oregon Corrections Enterprises inside Oregon’s state prisons.